Extensive soft tissue and orthopedic surgeries are readily performed, ranging from spays, neuters, and declaws to cancer, intestinal, fracture, and torn cruciate surgeries. Your pet will receive anesthetics tailored to him as an individual and will be monitored closely for complications both during and following the procedure. Laser surgery is commonly performed, which results in less pain, swelling, and bleeding leading to faster recoveries. Today's modern anesthetic agents have made surgery much safer than in the past. 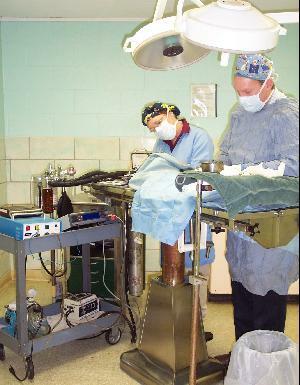 We safely anesthetize pets well into their teen years very commonly. 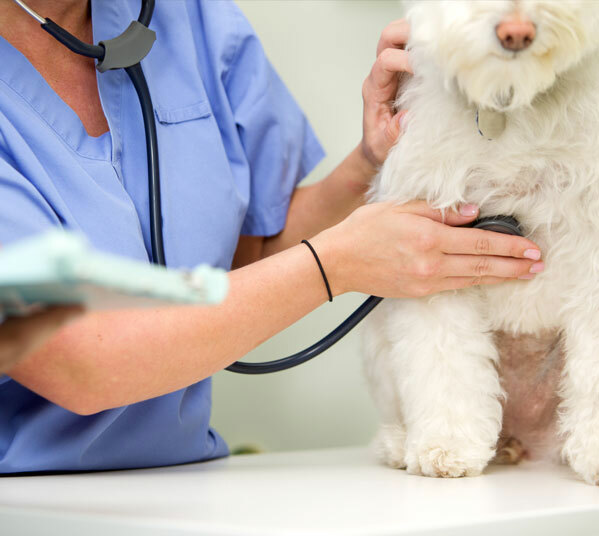 Here at New Carlisle Animal Clinic, we do a thorough physical exam on your pet before administering anesthetics, to ensure that a fever or other illness won't be a problem. We also adjust the amount and type of anesthetic used depending on the health of your pet. We use a variety of medications so we can choose the ones that are safest for your pet. In fact, most patients receive multiple medications since a low dose of several drugs is much safer and is better handled by the pet than a larger dose of a single drug. Anesthetic gas and oxygen are adjusted minute-to-minute so that your pet receives just the right amount. Your pet is monitored with state of the art machines that provide a reading of his heart rate, temperature, breathing, oxygen levels, and ECG. We are one of few area hospitals that routinely monitors blood pressure and carbon dioxide levels. Most importantly, a dedicated technician monitors these factors and others directly, adjusting the anesthetic to just the amount needed. Supportive care such as an intravenous catheter and fluid therapy, warm water heating pads or a wrap around warming device called a "Hot Dog", and other means of nursing care are routinely used to minimize potential risk and to maximize patient safety and recovery. Pre-anesthetic blood testing is important in reducing the risk of anesthesia. Every pet needs blood testing before surgery to ensure that the liver and kidneys can handle the anesthetic and that their blood counts are normal. Even apparently healthy animals can have serious organ system problems that cannot be detected without blood testing. Remember, pets cannot tell us if they feel a little "off." If there is a problem, it is much better to find it before it causes anesthetic or surgical complications. If serious problems are detected, surgery can be postponed until the problem is corrected. For geriatric or ill pets, additional blood tests, electrocardiograms, or x-rays may be required before surgery as well, especially if we need to check for evidence of cancer spread. IV fluids, given through a catheter placed into a vein just like people are given fluids during surgery, is strongly recommended to increase anesthetic safety. We place an IV catheter in almost all patients undergoing anesthesia. Your pet will be on IV fluids which help to improve metabolism and removal of anesthetic drugs from the body for faster recovery, they help to maintain good circulation and blood pressure for health of vital organs like the heart, liver, and kidneys, and they provide a fast access route to give emergency drugs in the event of an adverse anesthetic reaction. Finally, all other medications can be given through the catheter, so your pet does not have the pain of receiving multiple injections. Many hospitals do not include IV catheters and fluid use for elective surgeries like spays and neuters or charge extra for these services; we feel they are so important for patient safety that our "Preferred Plan" for these elective surgeries includes IV fluids (you can compare our "Budget Option" for lower cost spays and neuters on the menu at the left. It is important that surgery be done on an empty stomach to reduce the risk of vomiting during and after anesthesia. You will need to withhold food for at least 8 to 10 hours before surgery. Water can be left down for the pet until the morning of surgery. If your pet is taking medications, be sure to ask one of our team members if you should give the medication on the morning of surgery but most of the time, the answer is "yes;" diabetics do need to have the insulin dose adjusted that day too. Please describe the surgery itself. After your pet is anesthetized (sometimes this happens before hand), the surgical area is shaved, vacuumed, and scrubbed with a surgical disinfectant. He is then transported to the surgery room , positioned for surgery, and re-scrubbed. While this is happening, another assistant will be opening individual sterile surgical packs, drapes, operating gowns & gloves, suture material, and other supplies. Again, many other hospitals do not provide complete patient and surgeon sterile draping and sometimes even share instruments between patients without sterilizing in between! While this is being done, Dr Hans will be scrubbing his hands then put on a sterile gown and goves, just like on the medical shows on television. After surgery, the pet is transported back to our intensive care/recovery areas for further monitoring and pain management. For some surgeries, we use absorbable sutures underneath the skin. These will dissolve on their own, and do not need to be removed later, which is also the case if a surgical "glue" is used to seal the incision. Most surgeries do require skin stitches or staples. With either type of suture, you will need to keep an eye on the incision for swelling or discharge. Most dogs and cats do not lick excessively or chew at the incision, but this is an occasional problem you will also need to watch for. If there are skin sutures, these will usually be removed 10 to 14 days after surgery. You will also need to limit your pet's activity level for a time and no baths are allowed for the first 10 days after surgery. Anything that causes pain in people can be expected to cause pain in animals. Pets may not show the same symptoms of pain as people do; they usually don't whine or cry, but you can be sure they feel it. Pain control medication usage is mandatory in our hospital; many clinics make it an elective, add-on option. The type of pain medication used will depend on the surgery performed. All animals undergoing surgery receive an injection of medication to relieve post-operative pain; usually it is given before surgery so that it is already working when they wake up. We also use long acting local anesthetics, especially for major surgeries and dental surgery. For patients demonstrating the need, especially those that have undergone major surgical procedures, additional pain relieving injections are given. Most patients will be sent home on oral pain relievers as well. For especially minor procedures, we occasionally will just have you use over-the-counter pain relievers but keep in mind that you MUST use the specific brand and dosage recommended as not all human pain relievers are safe for animals. In fact, most human products are deadly to cats. Never give any human medications to your pet without consulting with us, and be sure to let us know what other medications your pet is on, to avoid complications from drug interactions. In most cases, your pet can be treated with our Low Level Therapy Laser which also reduces post-operative pain, swelling and inflammation and speeds wound healing. For some conditions, especially orthopedic surgeries that might also involve physical therapy, on-going laster treatments also help to speed recovery and more rapid return to normal function. For more information, click on "Links" on the right, then "Low Level Therapy Laser"
When does my pet go home? For most patients we try to send them home the same day as surgery. However for painful or lengthy surgeries, the pet will usually stay at least one night after surgery so that we can keep the pet comfortable with pain medications until they can handle oral medications and that they are eating well. We do keep declaw patients overnight to prevent injury to the paws from excessive activity. We prefer to schedule surgery releases in the afternoon, at which time we will go over home care instructions. Laser surgery is an option for most surgeries. A focused beam of light is used to cut tissue rather than a scalpel blade, so there is no pressure placed on tissues. It seals smaller blood vessels, lymphatics, and nerve endings, which results in less pain, less bleeding, and less swelling after surgery. This can lead to enhanced recoveries. In fact, smaller skin growths can just be "zapped" off with just a local with no incision or stitches being needed. While your pet is under anesthesia, it is the ideal time to perform other minor procedures, such as dental cleaning, ear cleaning, nail trims or implanting an identification microchip. If you would like an estimate for these extra services, please call ahead of time. This is especially important if the person dropping the pet off for surgery is not the primary decision maker for the pet's care.